My first foray into the world of media was actually on hospital radio, some years ago now. I loved it. I got to play the songs I wanted and talk about whatever I liked. A bit like podcasting, really! The thing that made me lose interest – and it’s so often the same thing with podcasters – was a complete lack of engagement with the audience… and that’s making the presumption that anyone was even listening! There are a number of things you can do to connect with your listener and grow your audience. Even before the podcast airs! Remember, your guest has fans, too! They’ll want to check your podcast out purely because of your guest, so give your episode the best chance of being heard by e-mailing your guest to remind them that their episode has gone live. In fact, be extra-helpful and include a direct link to the episode, including the show notes page and the option to share it to various social networks. Before you know it, dozens of extra listeners, and a good chance that’ll they’ll stick around for future episodes. If you don’t have interviews, then reach out to your community. Ask people to share your episode with anyone who might like it. There are groups on Facebook for everything – from new parents to people who like dressing up as Disney Princesses. (Guilty). Find a group – or even start one – that’s relevant to your podcast and share your work with people. Don’t just link-dump, though. Try to get involved in some of the discussions and make yourself known in a positive way. You’ll find people are happy to chat. Before you know it, you’ll be providing relevant content directly to your target audience. And, since you’re an active and helpful member, they’ll reciprocate by sharing your show. Set up a page for your show, too. You can include show notes on there, as well as links that are relevant to your audience, maybe something you discussed in the latest episode. Somewhere in your podcast episode, be sure to tell people where they can find you. Ask for reviews! Tell people you want feedback. What do they like or dislike so far? What do they want to see in future? Reach out to your online communities, and even your friends and family. Ask them for feedback to help you learn and grow. Subscriptions and ratings & reviews are incredibly powerful at motivating people to improve and great for avoiding stagnation. Again, when I was doing hospital radio, once I’d gotten the hang of broadcasting I had no idea if I was any good or how I could improve. Feedback would have given me the challenge and the impetus to do so. The blogger’s favourite! At the end of each episode, and especially on any written posts you put out there, be sure to include what we call a “Call to Action,” also sometimes called the “Over to you” segment. See how I’ve left it open to listeners in both camps – those who agree and those who disagree. You’re inviting a discussion, not just looking for a pat on the back. Getting them involved helps to build trust and rapport with your audience. They feel like they’re a valuable part of your podcast, which they are! 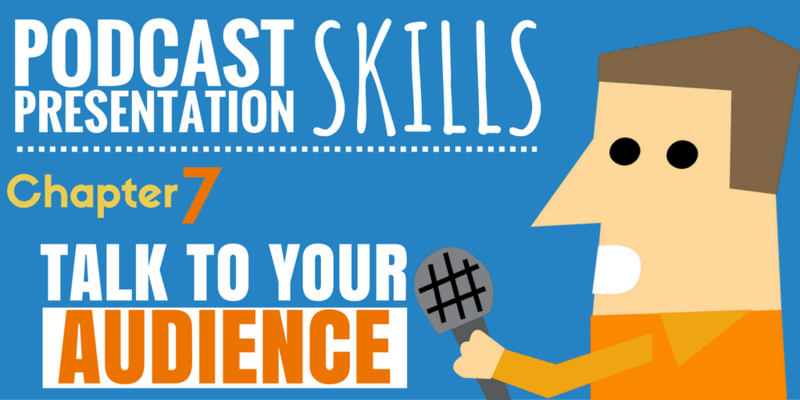 Well, time for the call to action – this is actually the last episode of the Podcast Presentation Skills series. I hope you’ve gotten plenty of useful tips from it. Here at The Podcast Host Ltd, we’re always trying to come up with content to help people with their own podcasting endeavours – it’s what drives us. And, funnily enough, I would genuinely love to have your feedback. How has the series helped you, if at all? What did you like? What should I have included but didn’t? Let me know in the comments box below. Happy podcasting! Chapter 3 – Learn to Breathe! Chapter 5 – Know Your Audience – what do they already know and/or want to hear? Chapter 7 – Talk to your audience – before and after. What do they like/ or want to hear? NextWhat’s the Minimum Equipment I Need to Start Podcasting?